from contemporary and vintage designs to classic style, in stock. Whether you need a wedding ring right now or have some ideas in mind and want help designing just the right ring for you, we have complete rings ready to go and a large display of ring styles that can be personalized for the stones and the metal type you choose. 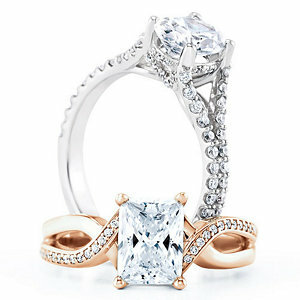 You can view and customize ring styles from our EVER & EVER collection by selecting the tab above. If you see a style you like you can customize it to your personal specifications and get an idea about pricing. We can help complete the process and select the stones that work for you. When everything is the way you want it we can tell you exactly what it will cost and when we can have it ready. We have a good selection of diamonds in house and a large diamond inventory to draw on so we can help you find the diamond you want at a great price. Let us help create the perfect ring for you.